We’ve been brainstorming some ideas for a new way of running the allotment service that can cater for the many different desires people have for allotments. One thing seems clear. That one size doesnt fit all. Offering ‘half plots only’ to everyone doesnt take into account that some people have lots of time to commit and therefore can cope with full plots, while some people have less time and like the idea of smaller plots. 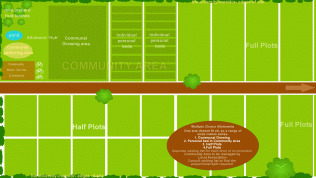 We have been thinking about how best we can offer people a choice of allotment size, therefore hopefully offering everyone an option suitable for them. We are thinking that there should be perhaps 4 options for prospective tenants which they can choose from, depending on how much time they have to commit. At the moment, people just have to put their name down on one big waiting list, it’s possible that many people on that list would in fact be happy with other options. Streamlining them could help speed up their progress down the list. We need to consult with those on the waiting list to find out if this idea sounds like a good idea. Possible options, from least time to most time available. Times are our own personal estimates (subject to change). We’d like to hear people‘s thoughts on this idea. Its only an idea, it hasnt been put to or agreed by the BHAF Committee. Its our personal attempt at Brainstorming solutions to the problems we are facing. 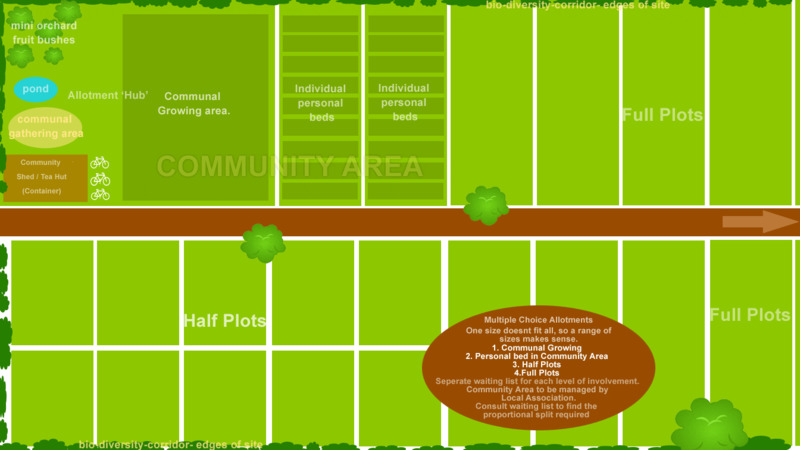 Community Plots already exist on some sites, as do some Allotment Associations. They may or may not be willing to run with this model.. and plot holders and those on the waiting list might not like it anyway.. we dont know until its discussed fully. We’d also like to hear from people who have other ideas to deal with the waiting list, plot size issues etc. We are lucky enough to be beginning to build a City Wide Strategy for allotments right now, so for the first time, in a long time, we have the opportunity to make some important changes to the way the service is run. The input of plot holders, Co Workers and even those on the waiting list will be greatly appreciated. To see a visual mock up of the idea please look at the pdf below.